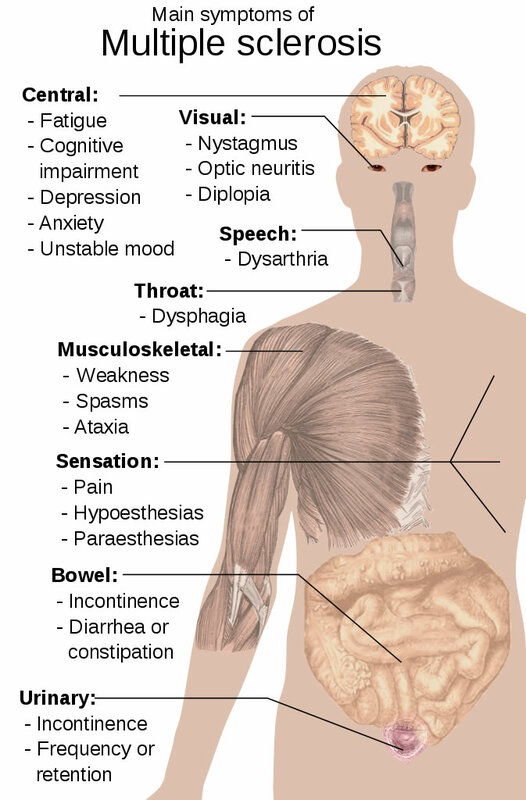 Multiple sclerosis is a chronic, degenerative disease of the central nervous system (CNS). The CNS is comprised of the brain and the spinal cord. In the CNS, the nerves are covered by a protective layer called the myelin sheath. Myelin helps keep the nerve healthy. It also improves nerve conduction. 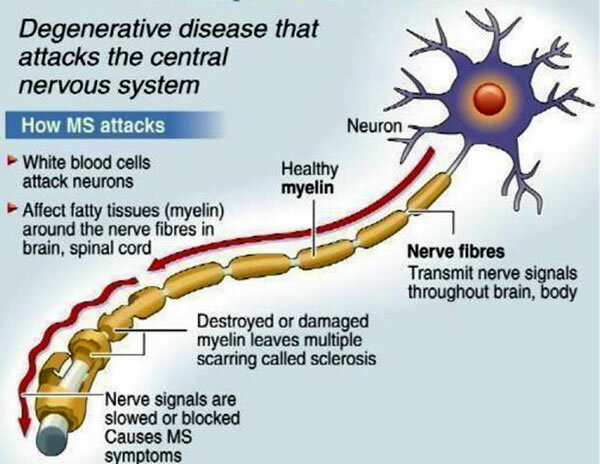 In multiple sclerosis, inflammation causes the nerves to gradually lose this myelin cover. This repeated inflammation and erosion leads to scarring (sclerosis), which impairs the nerve’s ability to conduct impulses. Eventually, even the nerves themselves are affected. Because the nervous system controls and coordinates a number of body functions, patients with MS gradually lose a variety of functions, including memory and the ability to see, speak or walk. Multiple sclerosis is a chronic debilitating disease that affects as many at 350,000 in the United States alone (2.5 million worldwide). Most patients are first diagnosed of the disease at age 20-40. However, the disease may appear as early as age 12 or as late as age 50. MS strikes women earlier in life. Women are also affected more frequently than men and whites more often than other races. The causes of multiple sclerosis are still unknown, although many factors are suspected. In the United States, whites are diagnosed with MS twice as often as blacks or Hispanics. Asians are the least affected. Genetic heredity. Family members of multiple sclerosis patients have a 1 in 50 chance of having MS; the odds for people without an affected family member are 1 in 1,000. If an identical twin is diagnosed with MS, the remaining twin has a 1 in 3 chance of becoming affected as well. Recent research has shown that several autoimmune diseases, including MS, share a common genetic link. In other words, patients with MS might share common genes with family members that have other autoimmune diseases like systemic lupus, rheumatoid arthritis, and others. Viral infection. Most MS patients have high levels of antibodies to measles and other viruses. Therefore, multiple sclerosis may be the body’s delayed immune reaction to viruses such as measles, Herpes simplex, rubella, and parainfluenza. A 2001 study also suggested that Epstein-Barr virus, the virus that causes mononucleosis, probably increases risk of MS.
Autoimmune reaction. Scientists know that MS is an autoimmune disorder, an illness in which the body attacks its own myelin as if it were a foreign substance. Although research has identified which immune cells are responsible and how they are activated, no one knows what causes the immune system to begin this attack. Geography. Countries in the temperate zones (above 40°) such as Northern Europe, North America, Australia, and New Zealand have significantly higher incidence of multiple sclerosis than countries in the tropics. In the United States, people who live below the 37th parallel develop MS at a rate of 57–78 cases per 100,000 people. Those who live above the line have a prevalence rate of 110–140 cases per 100,000 people. Diet. Studies have shown that populations at high risk of developing multiple sclerosis tend to consume a lot of dairy products and animal fats. On the contrary, in countries such as Japan, people eat few dairy products but consume lots of fish, soy-rich foods, and seeds, which are good sources of essential fatty acids. The incidence rates in these countries are very low. Thus, essential fatty acid deficiency due to excessive consumption of saturated fats may contribute to the development of multiple sclerosis. Patient’s symptoms indicate neurological damage in more than one areas. Patient’s symptoms have worsened for more than six months. There are at least two events (each lasting for more than one day) separated by at least one month. Neurological exam of the patient shows abnormal central nervous system function. Symptoms reflect damage in the white matter of the CNS only. Patient is older than 10 but less than 50 years old. Patient does not have stroke, lupus, or any disease that may have similar symptoms. A diagnosis of multiple sclerosis is made when patient’s symptoms fit Schumacher’s criteria and neurological exams, MRI, and laboratory results also show corresponding abnormalities. In 2001, a panel convened by the National Multiple Sclerosis Society wrote new diagnostic criteria for MS, the first update in about 20 years. The new criteria formally recommend MRI and outline how doctors should use the results of tests like cerebral spinal fluid analysis. MS symptoms vary significantly in terms of severity, intensity and duration. Sensory symptoms are the first warning signs. Many patients notice color distortion, blurred or double vision, and temporary blindness. Their senses of smell, hearing, touch, and taste are also affected. They experience muscle weakness and difficulty walking, as well as muscle spasms and numbness, tingling, or prickling (“pins and needles”) sensations called paresthesias. As the disease progresses, sudden partial or complete paralysis of the arms or legs is common, as are an inability to speak clearly, move without tremors, or hear clearly. Mental functions are also affected. Patients can not concentrate or remember as clearly as before. They often become depressed. They may laugh or cry uncontrollably. As conditions worsen, they lose control of bodily functions. Some patients find that hot weather exacerbates their symptoms. Cold baths or air conditioning may help during these periods. There are also periods, called remissions, in which patients are free of symptoms; remission can be complete or partial. While there is a rare, rapidly progressing form of MS that can be fatal in as little as a few days or weeks, MS generally affects the quality of life more than it diminishes life expectancy. Most patients can look forward to decades of life after diagnosis. Many are able to continue to live a relatively normal life for at least 20 years after onset, although some patients become disabled within a few months of being diagnosed. 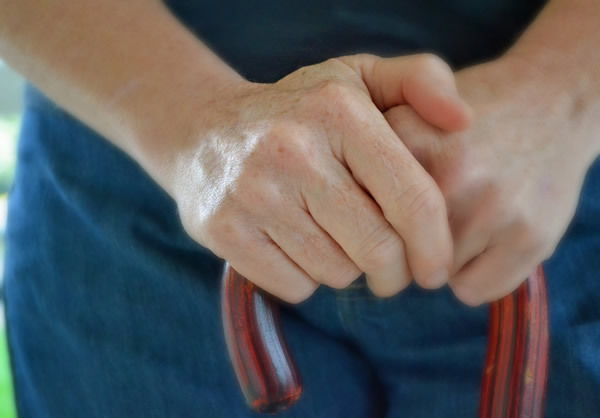 In addition, because MS patients are frequently forced into immobility and spend a lot of time sitting in wheelchairs they are susceptible to such common complications of the disabled as urinary tract infections, skin ulcers, pneumonia, or pulmonary embolism (blood clot in the lung) in addition to side effects from prescribed drugs. Consume no more than 10 g of saturated fat per day. Limit polyunsaturated fat consumption to 50 g or less per day. Take 1 tbsp of cod liver oil per day to supplement essential fatty-acid intake. Cod liver oil is a good source of omega-3 fatty acid, one of the two essential fatty acids. Consume adequate amount of protein in the diet, preferably plant protein such as soy, beans, seeds, and nuts. Eat more fish, a good source of omega-3 fatty acid. Swank recommends having fish three or more times per week. Omega-3 fatty acid is believed to support myelin production and improve nerve function. Flaxseed oil. Murray and Pizzorno recommend replacing the fish oil in Swank’s diet with flaxseed oil because the latter can provide both omega-3 and omega-6 fatty acids. Omega-6 fats, studies have shown, also help alleviate MS symptoms. Antioxidants such as selenium, vitamin C, and vitamin E. Patients with multiple sclerosis often have antioxidant deficiency. Vitamin B12. MS patients often lack Vitamin B12, and correcting this deficiency is believed to help decrease myelin destruction. 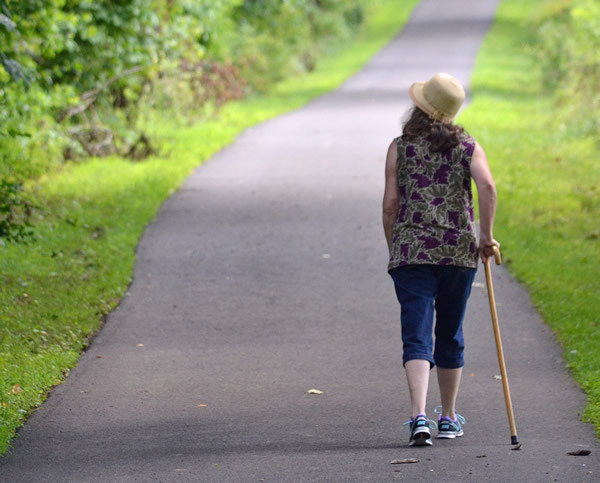 Almost any form of exercise or movement therapy is beneficial for MS patients. For patients too weak to exercise alone, a massage or assisted physical therapy should be helpful to improve circulation to the limbs and promote well-being. Those that are less restricted may find t’ai chi, qigong, yoga, martial arts, conventional cardiovascular exercise, and/or water aerobics helpful. Other alternative treatments such as aromatherapy (body massage with rosemary or juniper essential oils) and hydrotherapy (hot or cold baths used to treat affected areas, also a program of exercise performed in water) may also improve muscle strength in MS patients. Chinese herbs, especially ginseng, are also helpful in managing the disease. Wearing a cooling vest may also help, according to a 2001 study. The vest cools patients (without affecting their temperatures) and also appears to promote production of white cell nitrous oxide, which may play a role in MS.
All are administered by injection. These drugs have significant side effects including fever, tiredness, weakness, chills, muscle aches and inflammation at injection sites. Avonex may be better tolerated than Betaseron. For symptomatic treatment of muscle spasm, Baclofen is most effective; its dosage must be carefully tailored to specific patient’s needs. An implantable infusion pump that delivers the drug directly into the spinal cord can be used for patients with severe spasticity. Diazepam (valium) is sometimes given together with baclofen to increase its effectiveness. Alternative antispastic drugs are tizanidine and dantrolene. Steroids such as methylprednisolone and prednisone are also sometimes used to treat flare-ups. Patients whose symptoms worsen quickly right after diagnosis, those who have significant impairment in muscle movement or brain functions at onset and who have very abnormal magnetic resonance imaging (MRI) results at the beginning have poor prognosis. On the other hand, patients who recover quickly after the initial symptoms or those who experience only sensory impairment for five years or more after diagnosis often are able to maintain work longer and live longer than those with chronic progressive multiple sclerosis. There is no way to prevent the onset of multiple sclerosis, though a diet low in saturated fat may be helpful.